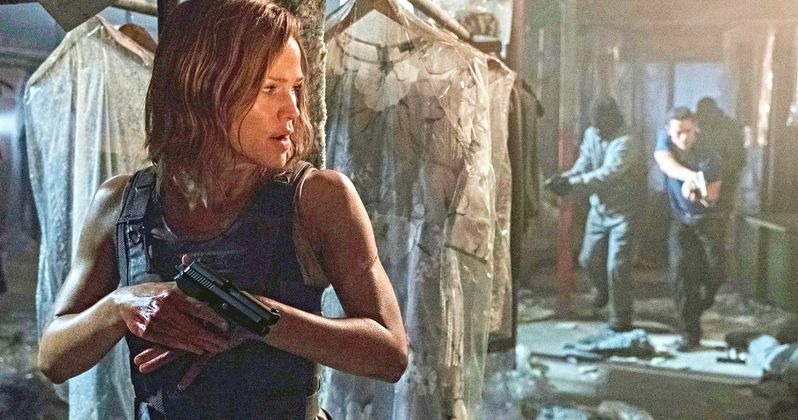 A new behind-the-scenes look at Peppermint showcases the training that Jennifer Garner underwent to bring the Riley North character to life. The action-revenge movie find's Garner's North character witness the drive-by shooting that kills her husband and daughter. After the justice system fails her, North goes into hiding for five years, training to become a lethal assassin in order to take justice into her own hands. Garner talks about the film, as well as getting in fighting shape, in the latest Peppermint featurette. Jennifer Garner was drawn to Peppermint because of the original storyline and for the reason that it puts a strong female as the focus. Director Pierre Morel, who also directed Taken, says that the 46-year old actress was already physically fit before taking on the project, but that she trained a lot to prepare. Garner shed some light on what kind of training she did to get ready for Peppermint. She explains. "I've been training for a while on this. I did MMA skills, gun skills, knife skills. It was the connection to the physical that made me kind of understand her fight for her daughter... The action is smart and the fights are smart and they're all me. What would you fight for more than your family?" To further prepare for her role in Peppermint, Jennifer Garner revealed that she practiced Cryotherapy every day, which is a process that involves standing in a chamber of freezing temperatures of about -130 degrees Fahrenheit for a few minutes. The therapy is supposed to cut down on muscle cramps and also reportedly helps with weight loss. Garner also worked with celebrity trainer Simone De La Rue for aerobic exercise and then worked with wellness expert Kelly LeVeque on her diet, which started every day with a smoothie. LeVeque had the actress on a strict diet of protein, fat, fiber and greens. Shauna Duggins is Jennifer Garner's stunt double in Peppermint and has been with actress for nearly 20 years, going back to third episode of the TV series Alias. Duggins echoes Pierre Morel's comments about Garner's training and estimates that Garner did 98 percent of her own stunts. She says, "every single fight scene is her. There are some hits, and you see her face hit the ground." Duggins also says that the fights are gritty and that Garner brings a truth to the role. Related: The Nun Vs. Peppermint: Which Wicked Lady Will Rule the Box Office? Peppermint opens in theaters on September 7th and was directed by Pierre Morel. In addition to Jennifer Garner, the film also stars John Ortiz, John Gallagher, Jr., Method Man, Richard Cabral, and Tyson Ritter. The movie was written by screenwriter Chad St. John. Garner is clearly excited about her role in the upcoming movie and worked hard to make sure every hit was real. You can see more of Garner's Peppermint training below, thanks to the STX Entertainment YouTube channel.